So, here we are, on the road in 1966, ending up in Montgomery County, Maryland, just outside the then-tiny burg of Olney. The Family Project begun by Dad is well underway. Project manager, Paul Jr. Assistant to the project manager, Jackie. Minions, lackeys and sons Michael and Brian. This picture was taken at the height of Dad’s East Coast experiment. Money was coming in; he worked long hours in Bethedsa. Mom was a registered nurse at the Montgomery County Hospital, working the late shift (you can kind of see the rings around her eyes in this photo). I’m probably 9 or 10, so bug-eyed baby brother Brian would’ve been 7 or 8. Dad was probably around 37 years old. Mom would’ve been 34. They were never sharper, in mind and body, than they were then. 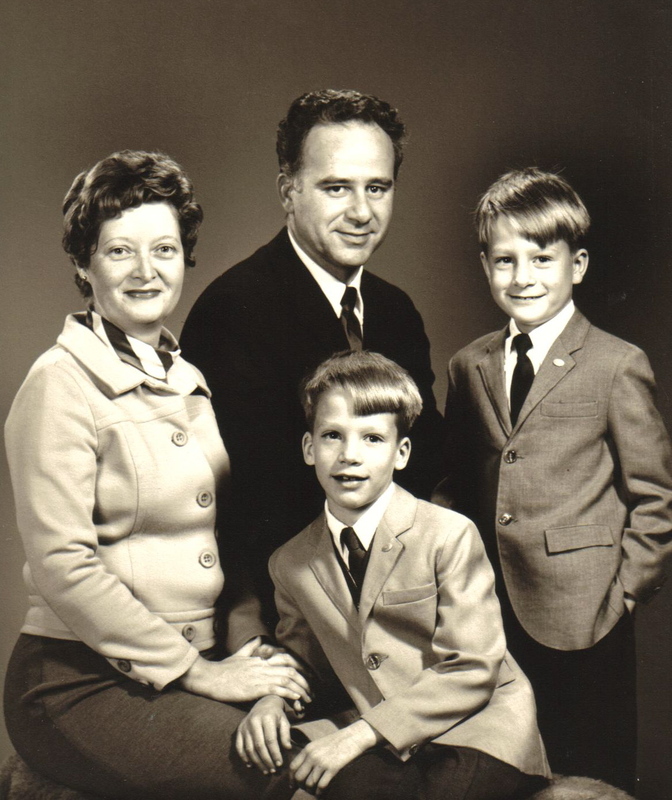 I guarantee Pop made sure we were all dressed just so: sharp clothes, big smiles—but you can already see I’m cracking under the weight of The Project—hair’s a little longer, my smile grudging. I have no doubt that behind my back Dad’s tugging at my sport coat, muttering for me to behave. So this photo has some grit in it, at least for me. Obviously no one chooses the condition they’re born into—parents, siblings, home life, whether you moved too much or too little, had no money, had a lot of money. Looking at these photos, the letters, the documents— everything—I realize how very, very lucky we were. I had a father and a mother and a brother. Now only a brother. I wonder how he and I can be closer, but we are so, so different. But, in Maryland, it was a blossoming period in so many ways. There was the house Dad rented: a two-floor Colonial with pine trees in the front yard that looked out toward Olney at cows grazing in a field, a huge garage in the back that was equipped with old farm tools and stuffed with tarp-draped furniture left by the previous owners, a woodshed, even a playhouse they’d built for their kids. 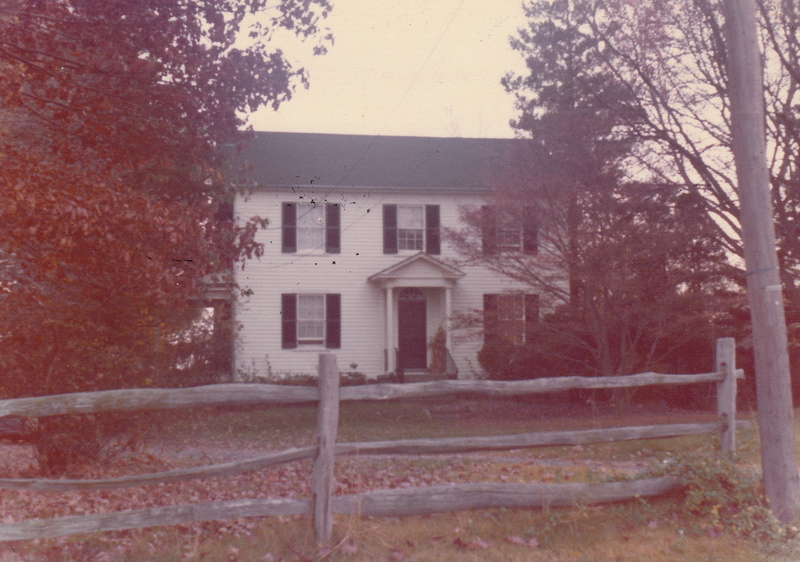 Farther in the back, at least an acre of apple trees, dogwoods and hedges that led to a neighbor’s horse field. Skirting that field, we used to run as fast as we could before the horses would canter after us, and bolt toward the copse of trees where kids built tree houses and ground forts. It was our world to play in. I’ll have more to say about that yard, those woods, the neighborhood. It took me a while to get used to the house—it was so big! You came through that front door and the dining room was to the right, to the left the living room with fireplace, floor-to-ceiling bookshelves, French doors in the back that lead into what Mom called “the Music Room.” In that room there was an upright piano. Dad kept his ukulele (I never once remember him playing it). A mud room separated Music Room from stairs leading to the basement and the kitchen in the back of the house. Past the front foyer stairs led up to the master bedroom, an upstairs bathroom, closet, a bedroom my brother and I shared with bunk beds and, down the hall, the “spare room” where Mom sewed and did the ironing. That room had a small black & white TV where I used to stay up late and watch monster movies like Creature From The Black Lagoon, Them! or The Wolf Man. The folks would yell for me to turn the TV off and go to bed. I’d dart down that scary long hall back to the bedroom, because, you know, the Wolf Man might’ve just broken into the house. ~ by completelyinthedark on October 20, 2010. Tags: Bethesda, Creature From The Black Lagoon, Dad, Mom, monster movies, Montgomery County Hospital, Olney, television, The Wolf Man, Them! great photo……Promising future, the good Life…you chose them all before you were born for the lessons you needed to learn my friend.